What an April it's been! 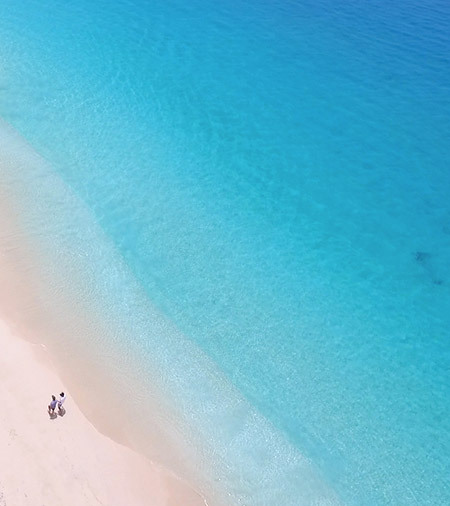 This April we got adventurous and trekked out to the infamous Captain's Bay… the beach many Anguilla regulars have heard of but few have actually visited. 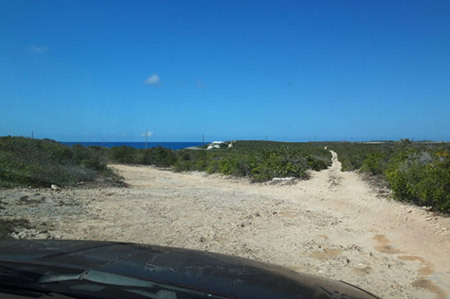 It's the second farthest beach in the East End of Anguilla and it's very hard to get to. There are no signs leading the way and the road to Captain's Bay is rough. Some try and succeed. Some try and fail to find it. Some don’t even try because they hear it’s too hard to find on your own. Hopefully this will help those who are curious but haven’t stepped foot on it yet. It’s really not that hard if you acquaint yourself with a map of Anguilla and keep your patience. To take our virtual walk of Captain's Bay (including information on how to get there), click here. I’m going to give you the bad news first; Criss Conch Shack is only open every week from Thursday through Sunday. If you can handle that, then the rest of the news of this new and already well-followed spot on Sandy Ground will be good. 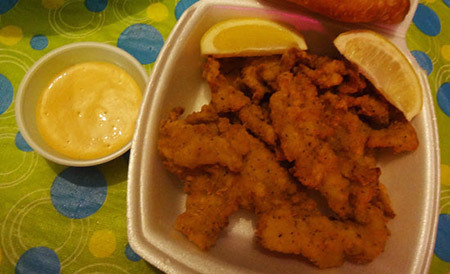 What’s so great about the Criss Conch Shack? Fresh local conch and fish, delicious fried Johnny cakes, local drinks, decent prices, nice people, convenient, located on the beach in Sandy Ground, and you can show up barefoot! Read more on Criss Conch Shack here. 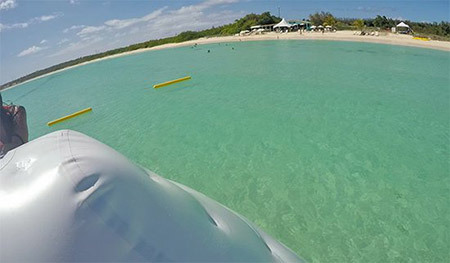 The Anguilla Aqua Park is Here! Since 2014, Anguilla Watersports has been introducing new and fun ways to enjoy the breathtaking blue of Anguilla's clear waters. 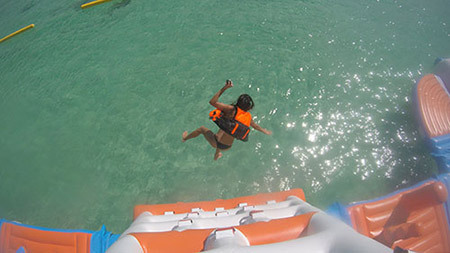 The Aqua Park sits at 100 feet x 100 feet, making it the largest of its kind in the entire Caribbean. 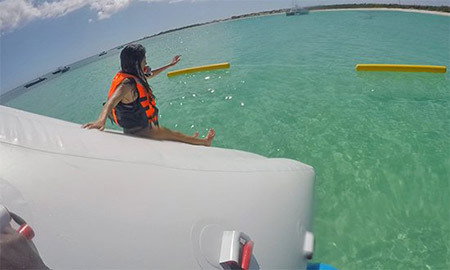 It features the main inflatable "obstacle course," which is made up of "floating islands," and several "independent island" floats. 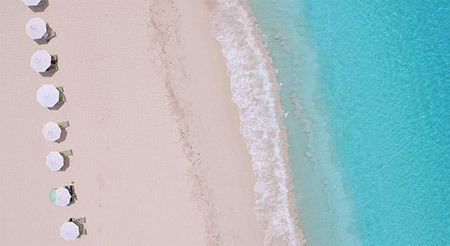 Pretty as a picture, it touts Anguilla's national colors, the signature orange, white and turquoise, and calmly bobs atop the clear Caribbean seas of Cove Bay. It is set about 50 yards from the shoreline and about 150 yards south-east of Smokey's, tucked in the more active part of Cove Bay. The park is roped off in the water, separating it from the fishing boats that anchor to the east end of Cove Bay and the day charter boats from St. Maarten that moor to the west of the park. The question was, what would the experience actually deliver? Click here for the full Aqua Park experience. A huge congrats to CuisinArt on the launch of their band NEW, beautiful website! 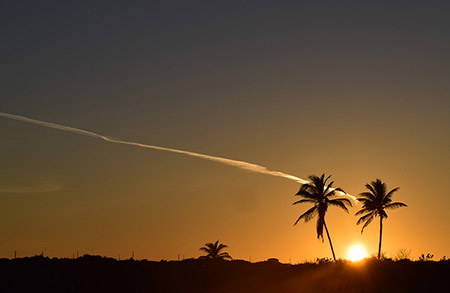 For years, CuisinArt's Golf Club served classic clubhouse fare by day (at the "Clubhouse Grill") and was transformed into a gourmet Italian restaurant by nightfall ("Italia"). Today, the "Clubhouse Grill" is no more. Its menu has been replaced by one that brings you a taste of Italy. Yes, for all Italia fans, I have good news... Italia is now open for lunch and dinner, and it is home to one of THE best sandwiches on the island. Perfectly thin slices of Prosciutto di Parma melt in your mouth. The smoked mozzarella accentuates the savory flavors, with the sharp arugula offsetting the sandwich's rich qualities. The bread it's served on deserves a special mention, too. A crusty bread, similar to ciabatta, it is oily and crisp, house-made. With CuisinArt's juicy-fresh tomatoes, each bite is heaven. This sandwich is an absolute stand out. Whether dining post-golf or seeking a lunch spot with endless vistas, Italia impresses for dinner and lunch! 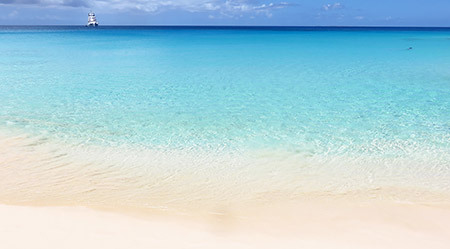 Last Chance to Enter to Win a $10,000 Luxury Anguilla Vacation & Support a Worthwhile Cause! A 6 night stay at the luxurious Viceroy resort, a meal for each day of your stay, car rental, transport to and from SXM and a host of activities (sunset cruise, tubing, massages, private fitness training)! All proceeds go towards his team's trip to the internationally recognized fitness challenge, Tough Mudder in Atlanta, Georgia this May where they will be the first team ever to represent the Caribbean! What is coming up this May? Occurring every Whit Monday, Welches Festival brings you a delicious and jolly slice of old Anguilla. More on Welches Festival here. 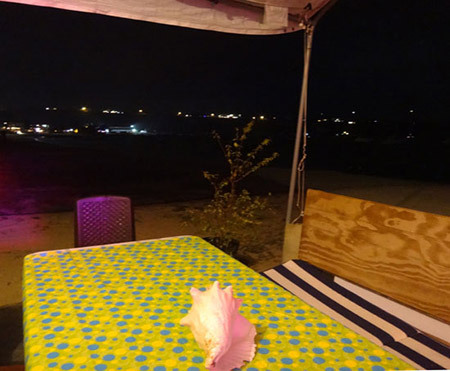 A Literary Jollification that takes place at Paradise Cove, Anguilla Lit Fest pays homage to Anguilla’s literary heritage and offers an opportunity to network with world-class writers and thinkers in a beautiful location! More on Anguilla Lit Fest here. Held yearly at Viceroy, Mother's Day Brunch is always a beautiful morning with delightful breakfast eats and it's for a good cause. 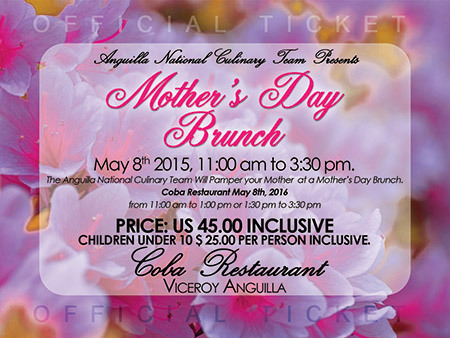 It is one of Anguilla's Culinary Team fundraisers. 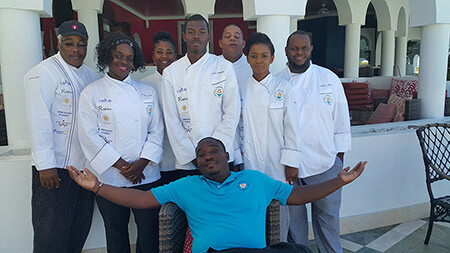 Proceeds go towards the team's participation at the prestigious Taste of the Caribbean competition in Miami this June. It is going to be another wonderful event and it's a great opportunity to support our national team and cheer them on to victory in Miami! In case you haven't heard all of the hype... Majah Hype, internet superstar, is coming to Anguilla this May 14! 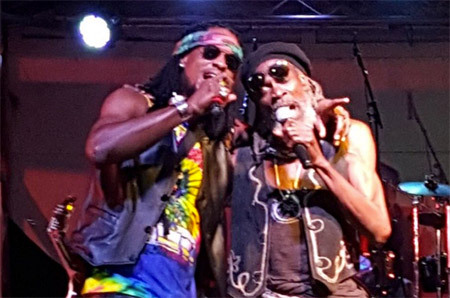 Together with Di Rass and Grandpa James, it's sure to be a fun-filled night of music with lots of laughs. More information here. Curious about the novel methods behind Anguilla's Jammin'? The lovely Molly & Tommy hold free tours of their gardens weekly on Thursday mornings as well as free jam tastings! More information here. 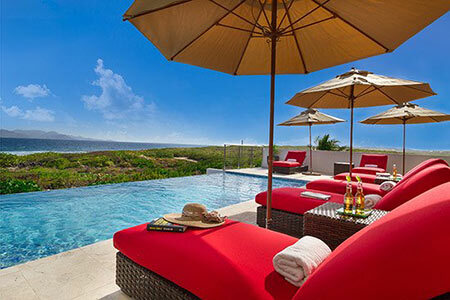 The villa that offers it all, Tequila Sunrise Villa is a dream! 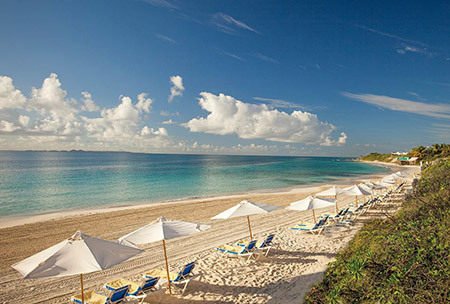 Set on the south coast of Anguilla, the scenery takes your breath away. 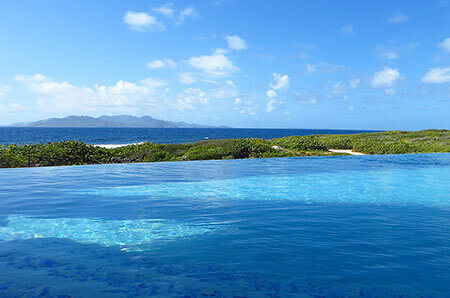 Their spacious terrace (with plush lounge chaises and pool floats) overlooks their infinity edge pool, which drops off to the Caribbean Sea and St. Martin in the distance. Three bedrooms gaze out to the same stunning view, and each bedroom comes complete with flatscreen TV and private en-suite bathroom with outdoor shower. Best of all? The villa is set just 2 minutes from an undiscovered cove with ideal beginner snorkeling! And... your stay includes unlimited Silver Patron Tequila, housekeeping and 24 hour concierge service. All of this is beautifully showcased in Tequila Sunrise Villa's brand NEW villa video. To get the full Tequila Sunrise Villa experience, check out the video here. Hi Nori! Thanks so much for my new Anguilla card. 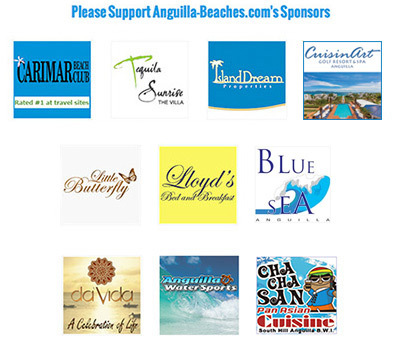 We visited Anguilla three times last year and saved a substantial amount using the Anguilla card. 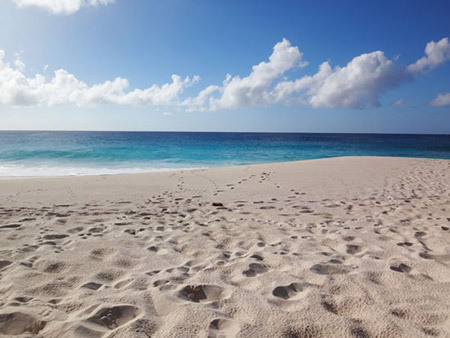 We used it at many restaurants, our car rentals and boat transfers to and from St. Maarten. You do a fantastic job on your newsletter keeping us informed about the exciting things going on around the island. Every time I read it and look at the amazing pictures it makes me wish I was there! 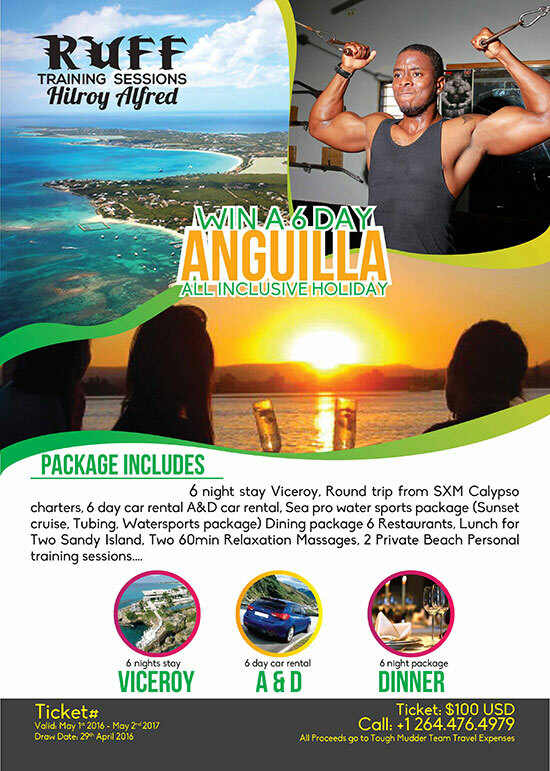 To get your Anguilla Card (and your subscription to the exclusive Anguilla Card Holder Newsletter), click here.